The Program directors will be presenting updates on the latest program initiatives from 8:30 - 9:30am, please come on time so they can share all exciting new and upcoming national and regional programs before the 2018 Eastern Regional Conference in Baltimore, MD. On behalf of the Maryland State Directors of Zeta Phi Beta Sorority, Incorporated and Phi Beta Sigma Fraternity, Incorporated, we would like to invite the Brothers of Sigma and the Sorors and Amicae of Zeta to our 1st Blue & White Evening in Annapolis. The event will occur on January 30, 2017, from 6 pm to 8 pm. 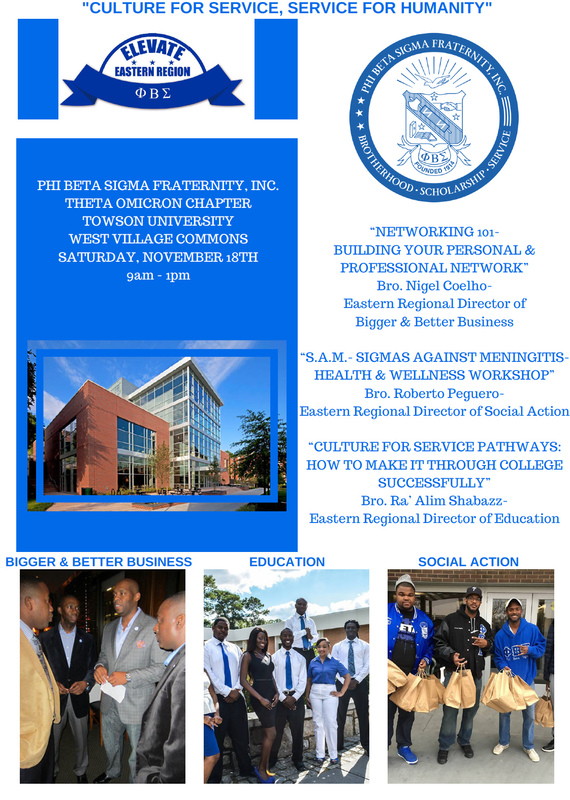 Celebrating 100 Years of Gamma chapter of Phi Beta Sigma Fraternity Inc. The 26th Eastern Regional Director, Honorable Bro. Devon Henry, came to fellowship with the Gamma chpater in honor of Their Centennial. Bro. Henry presented Gamma with an award of recognition received by Bro. President Ricco Peña. One in seven fathers, sons, husbands, brothers, partners, and friends will be diagnosed with prostate cancer, including 3,840 men in MD this year alone.